Drag and Drop URL from address bar to favorites bar. As one Insider wrote: “The one thing I miss from google Chrome is being able to click and drag from the address bar down into the favorites bar and it’s there just as simple as that. It’s convenient and easy, I like it. And I can drag where in the bar I want it rather than saving it just to the end of the list every time.” Now you can do the same thing in Microsoft Edge. Just click on the icon next to the URL and drag anywhere on your Favorites bar. Improved address bar design: Prior to Build 16257, many Insiders noticed that text would shift as an URL prefix appeared (such as http:// or www). This made it difficult to partially select the URL to make edits. Based on your feedback, we adjusted the design of the address bar. Now, even if the address bar isn’t in focus to start with, when you click and drag the text, it will remain under the cursor. This change makes it easier to quickly edit parts of the URL. Edit URL for favorites: Insiders asked for it in the Feedback Hub – and we delivered, starting in Insider Preview build 16237. You can now edit the URL of any favorite in the Favorites menu or the Favorites Bar. This is a handy feature for to updating the location of a site that has moved, or to create Bookmarklets in the favorites bar. To edit the URL of a favorite, simply right click or press and hold a favorite and select ‚Edit URL‘. We couldn’t agree more! Now, if you’re reading a PDF, you can select the “Add notes” button next to the address bar to mark the PDF up with Windows Ink. This feature lets you take notes with a pen or highlighter right on the page – perfect for marking up a draft, signing a document, or filling out a form! You can also save the work onto the PDF file for later use. 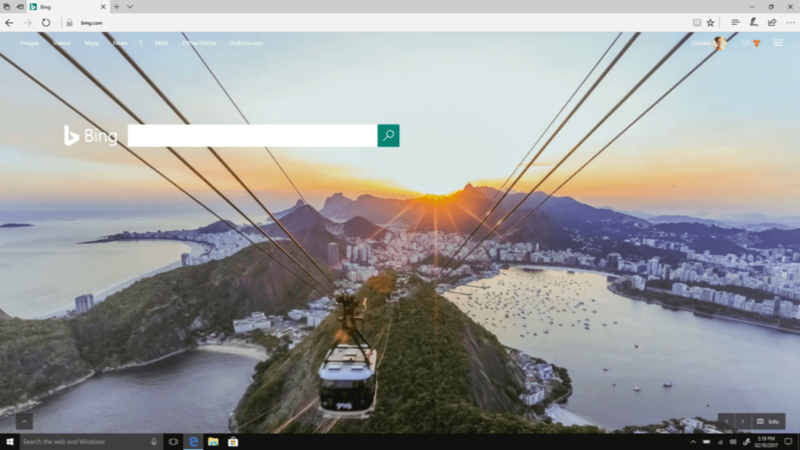 Browse in full screen: Another popular request from our Windows Insiders was to introduce a true full screen browsing experience to Microsoft Edge. To browse in full screen mode, select the More … menu and click the “Full screen” arrows icon, or press “F11” on your keyboard. Full screen mode hides things like the address bar and other items from view so you can focus on your content. To exit full screen mode, move your mouse near top of the screen or swipe down with your finger and select the “restore” icon in the top-right, or press “F11” again. A better platform for Edge extensions: It has been a little more than a year since Microsoft first shipped the number one requested feature for Microsoft Edge – extensions! Today, in the Windows Store, our partners are offering over 70 extensions worldwide, and are adding more every week – including popular extensions like Grammarly. We’re always evaluating additional API support for future releases. You can see the extensions APIs that we currently support at our Extension API roadmap, as well as those that are under consideration (for example, Downloads and Notifications). As we kick off other exciting new developments for Microsoft Edge in the next (RS4) Insider Preview builds, we look forward to more great suggestions from our Insiders. Whether it’s a suggestion for an improvement to an existing feature, a new extension – or an entirely new feature, download the latest Insider Preview build and let us know your thoughts on UserVoice or the Feedback Hub.